In their paper on global palynofloristic provinces, Herngreen and Chlonova (1981) listed the characteristic taxa of the Palmae Province, which existed in Africa and northern South America in Senonian (Coniacian through Maastrichtian) time. Most noteworthy among them are the palm pollen genera Psilamonocolpites, Retimonocolpites, Proxapertites, and Spinizonocolpites. Assemblages in which palm pollen is prominent characterize upper Senonian strata, but angio-sperm pollen becomes increasingly diverse. Among the angiosperms are the morphologically distinctive Buttinia andreevi and Droseridites senonicus; the syncolporate genus Cupanieidites; and species of the triporate genera Echitriporites, Proteacidites, and Triorites (especially E. trianguliformis, P. dehaani, and P. sigalii). Rare occurrences of species more typical of the Normapolles and Aquilapollenites provinces are also noted within the Palmae Province in Africa, and some African genera are also known in contemporaneous rocks in India (Herngreen and Chlonova 1981). Kaska (1989) summarized the Lower Cretaceous to Tertiary palynostratigra-phy of Sudan. A composite stratigraphic section ranging in age from Barremian through Paleogene included only five palynostratigraphic zones. Zone C, which encompasses most of the Upper Cretaceous, ranges from Turonian through Maastrichtian; it is overlain by Zone D of Paleocene-Eocene age. The palynoflora of the uppermost Cretaceous includes many of the key species of the Palmae Province mentioned by Herngreen and Chlonova (1981). 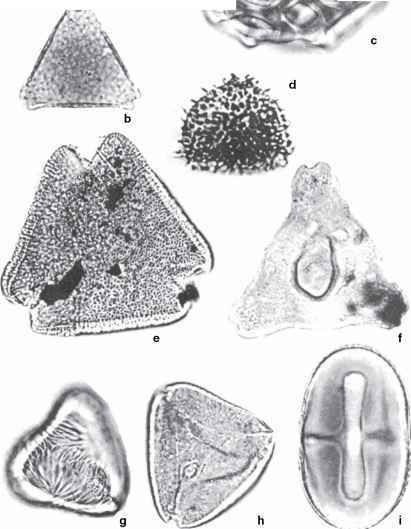 Kaska (1989) noted that the common markers for the uppermost Cretaceous are Proteacidites sigalii, Buttinia andreevi, and Echitriporites trianguliformis, and that rare species of Aquilapollenites and Normapolles pollen are also present in the Sudan section. Kaska stated that, in his composite section, there is a transitional interval between Zone C and the overlying Zone D that is at least in part Paleocene in age. The interval is composed largely of lacustrine beds, in which the most characteristic species is the freshwater fern megaspore Ariadnaesporites. Clearly, no K-T boundary can be recognized in Sudan at this time. Salard-Cheboldaeff (1990) compiled palynostratigraphic data from the Maastrichtian to the Quaternary of western Africa, in Senegal, Ivory Coast, Ghana, Benin, Gabon, Congo, and Angola. From these data, she concluded that the palynological assemblages from this intertropical area differ significantly from those of northern Africa but have much in common with those of South America and to a lesser extent with those of India. Salard-Cheboldaeffs species list from Benin includes Buttinia andreevi, Proteacidites dehaani, P. sigalii, and a species of Spinizonocolpites in the upper Maastrichtian. In Cameroon, Proteacidites dehaani and Spinizonocolpites, among others, are present in the upper Maastrichtian, and a species of Proxapertites characterizes the Paleocene. Thus, the pattern appears to be familiar, with typical species of the Palmae Province present in the uppermost Cretaceous of western Africa. Palms such as those represented by Proxapertites pollen continued to develop in the Paleocene while gymnosperms declined. The pattern of stratigraphic ranges of 163 mostly species-level taxa plotted by Salard-Cheboldaeff (1990) showed no significant extinction across the K-T boundary. Palmae Province, but pollen of the Normapolles Group is present, as well. The latter species have a European affinity and serve to distinguish this palynoflora from those of western and central Africa, as noted by Salard-Cheboldaeff (1990). In the Paleocene part of the section, palm pollen increases in abundance along with pollen of the Normapolles Group and the family Juglandaceae. Thus, the Paleocene assemblages of northern Africa show more affinity with those of Europe than with those of western and central Africa or South America. Meon's (1990,1991) study of the K-T boundary interval at El Kef presents intriguing data. The palynoflora became impoverished in the upper Maastrichtian, but Meon ruled out a catastrophic cause for changes in palynological assemblages at the K-T boundary. She interpreted the change across the boundary to be the result of a gradual, climatically induced extinction. Other interpretations are possible, however. Meon (1990) reported that 55 palynomorph species disappear before or at the boundary. Meon's plot of stratigraphic range data (Figure 9.3) shows about 250 m of section in which disappearances proceed at a steady rate up to the K-T boundary (Figure 9.4). From Meon's data we calculate that 13.6% of palynomorph taxa occurring in the uppermost zone of the Cretaceous (the unnamed zone just above the Abatomphalus mayorensis foraminiferal zone) disappear at the K-T boundary, either in the sample at the boundary or the one just below it. Song and Huang (1997), citing the data of Meon (1991), reported 53.3-55% extinction across the K-T boundary at El Kef, although we are unsure how they arrived at such a high number. Regardless of the actual percentage, the pattern of range truncations of palynomorph taxa at El Kef shows a significant increase in the extinction rate of terrestrial palynomorphs over background extinctions at the K-T boundary. The record from El Kef, Tunisia, is especially noteworthy because the International Commission on Stratigraphy recognizes it as the Global Stratotype Section and Point (GSSP) that marks the base of the Paleogene System, thus it can be regarded as the type section of the K-T boundary. The GSSP at El Kef is characterized by an iridium anomaly and foraminiferal extinctions. For our purposes in trying to determine the nature of the K-T boundary in the terrestrial realm, however, the marine section at El Kefis less than ideal. An extinction level among palynomorphs of terrestrial origin ranging from 13% (our figure) to 55% (Song and Huang 1997) must be regarded as significant because percentage extinction at nonmarine boundary sections in North America is on the order of 15-30% (see Section 6.3).